Mt. 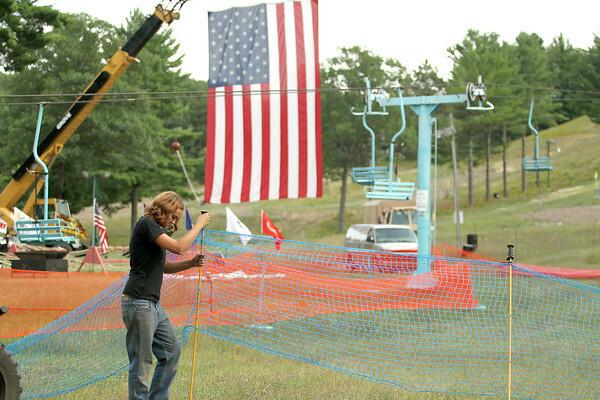 Holiday maintenance crew member Britni (cq) Solgot (cq) sets up a fenc for Saturday's King of the Mountain race, which will feature 20 obstacles on a five kilometer course on Mt. Holiday. Teams and individuals will compete, with a team from each branch of the military among the entries. Registration is open until 11 a.m. Race proceeds will go to the non-profit Mt. Holiady and the the Ryan Patrick Kennedy House, a post-traumatic stress disorder (PTSD) facility in Traverse City.